I love Splatoon. We brought it just over a week ago and pretty much have not put it down. It's like Call Of Duty for kids, but more fun. Online you are in teams of four and your aim is to cover as much ground as possible in your own colour ink using anything from paint ball guns to a giant roller. Oh and you can turn into a squid at any time to get around faster and surprise your opponents. Splatoon also looks great on the Wii U and makes good use of the Game Pad where you can see the map and deploy 'inc bombs'. It's also got a great soundtrack which you'll find yourself humming along to. In Splatoon, Nintendo’s uniquely family-friendly take on multiplayer shooting games, paint replaces live ammunition, charming tentacle-headed skater-types replace heavily armed Americans, and rather than simply shooting your foes, you win by spattering as much of the arena as possible in your paint’s colour. Arenas are designed like multi-level skate parks, with jumps and smooth transitions you can glide over before popping out and giving the opposition a damn good painting. 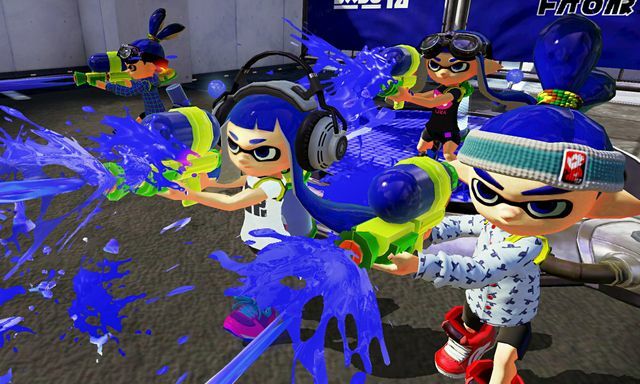 Winning matches earns new weapons (if you consider a paint roller to be a weapon), but more surprising is that the chaotic and absurdly competitive multiplayer game is complemented by a fully formed single-player mode. From the basic premise, Splatoon conjures dozens of fresh ideas, combining moving platforms, grids you can slip through, and exploding paint-filled objects.